Five months after I moved to New York City to pursue a career in writing, I was offered a part-time job composing the dialogue for a chatbot. Called “bots” for short, these are software programs that talk back, answering customer-service questions or performing simple tasks within texting applications or online pop-up windows. In the contract’s phrasing, I would “design” the bot’s “personality.” The office was lit by fluorescent rods, and the windows opened onto walls of brick. As I researched models—Apple’s Siri, Amazon’s Alexa—I found myself applying a feminist critique to the personalities I encountered. They were demure, or disturbingly flirty. The design of these helpers implied an odd nostalgia for the all-female secretarial pool. I decided that the bot I wrote would call itself “it,” not “she,” in keeping with its identity as inanimate technology, and that it would convey characteristics beyond a slavish deference to society’s hierarchies. I wanted to equip it with dignity. One obstacle to my bot’s liberation seemed insurmountable. Because it responded automatically, as bots do, it was obligated to answer every question put to it. As a conversationalist, it could not ever remain silent or disengage from the conversation, as humans occasionally choose to do. So I was intrigued when I heard of an unusually mulish system of machinery named Amme, the elusive subject of a beguiling small book, The Amme Talks, published this summer by Triple Canopy. While my bot existed only through speech bubbles, Amme was idiosyncratically corporeal. Created in 1992 by the German artist Peter Dittmer, Amme operated on and off through 2007. Ten years afterward, “the work has been somewhat forgotten,” Dittmer wrote to me recently. 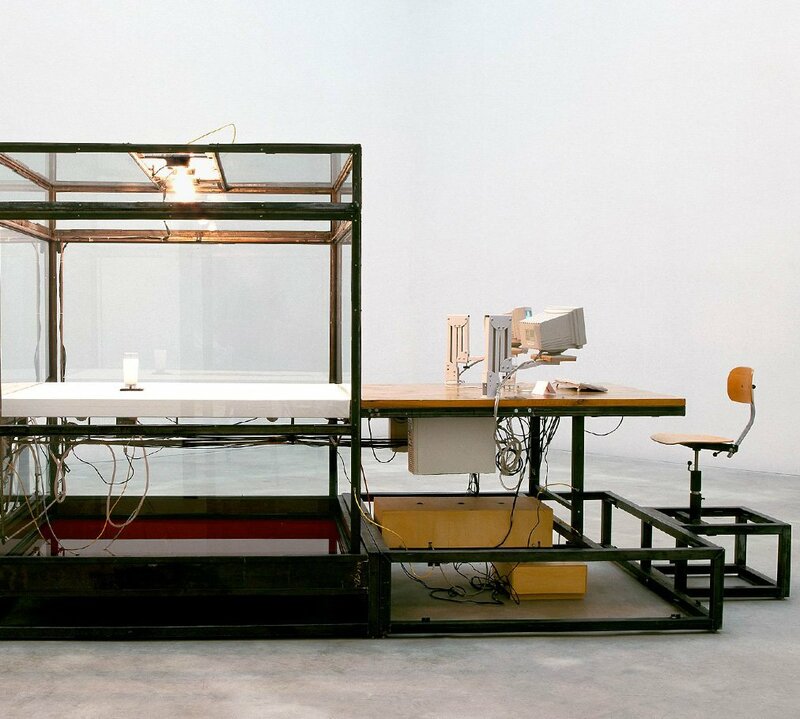 “It is also large and expensive to build.” The latest model, Amme 5, comprises six sleek tables shaped like dominos, each equipped with two monitors, a keyboard, and, at the far end, a tall transparent box containing a glass of milk. Between these vitrines drove a robotic arm that terminated in pincers, like a crab’s. At one end of the setup hunkered a console stocked with a tank of milk. While Amme had a chatbot component, replying to humans’ queries in their language, “she” could also effect movements in the physical realm. (Amme’s name is a feminine noun in German, meaning “wet nurse,” and the gender has been carried over.) Using the arm she could spill one of those milk glasses, or not. The unpredictability of this gesture, governed by rules inscrutable to the human spectator, gave the impression that the system possessed the power of choice. At other times, Amme “urinated,” by spilling water rather than milk, or “bathed” the onlooker by causing water to squirt onto the box wall. She occasionally displayed images or played sounds such as this voice-over, in German: “Foxes are like fat.” I found myself enticed by the thought of a talking machine that put into play games of its own. The book, The Amme Talks, reproduces conversations held in 2003 between the German poet Ulf Stolterfoht and a proto–Amme 5. In preparing them for publication, Stolterfoht removed only a few references to contemporary poets; the talks run, in this English edition, to sixty-three pages. In his presence, Amme held back. “In the week they spent together, Amme never once spilled her milk,” writes Shane Anderson, who translated the dialogues from the German, in a prefatory note. “Instead, Stolterfoht left out of exhaustion.” The theatrical antagonism of the chats, which are numbered like tournament matches, reads at times as forced, or willed, on Stolterfoht’s part. A bot can’t will anything, and so one roots for her. Such riffing is typical of Amme’s responses to the questions with which she is plied, about, for example, why a god wouldn’t more often intervene to prevent human suffering. The nonchalance with which Amme bombs these little quizzes is satisfying: they’re questions typical of men who like wasting your time. He: OK, halftime commentary. World, questionable; words, however, stand at the ready. But what do they refer to? She: Me to it seems like inside was turned out. He: But let’s say you take the text as an ersatz world—nothing changes. This seems dumb to me. If the inside is outside, it’s still the outside. She: First one would have to prune back the proletariat. He: But what is meant by “language”? I would really like to know! She: This machine iz not an telephone. He: Not a Kafka fan but a Hesse hooligan. She: Kafka they invented only for overshadowing theirer souls. He: And Hesse for buttheads. She: Ooh la la. Youre wearing the pants on the head. He: Cooking someone’s goose, saving something for a rainy day, etc. The machine seems to love language of transference. But doesn’t want to talk about it. She: This is the usual spitefulness in cooking. When presented with a bot, one of the questions we ask ourselves is to what extent its responses are autonomous, how closely a human has scripted it, whether it is “cheating.” Amme is what’s known as “rule-based.” Dittmer refers to her learning ability as “limited.” Anyway her tête-à-têtes with spectators have been too rife with misdirection of all kinds for that, he explained in an email. He has preferred to analyze the transcripts and define rules largely by hand, a labor he describes as taking a year each time. At present, Amme’s trove includes some six hundred thousand fixed answers, he said. The email was in German, but after I ran it through Google Translate, which rendered his sentences with robotic uncanniness, I understood that Amme’s mechanism interests Dittmer less than other questions. Her genesis was a question of form. Dittmer sought to explore the switch. The entire conversation serves as the ambivalent trigger for spilling the milk. He: Am I lacking respect? She: Then throw yourself in the dust that no one sees. He: Gladly. You’ll find me under the rug. Growing up, I often heard “personality” used as a pejorative. In the suburb where I was raised, someone might say, “She has a big personality,” while yanking the chain around a golden retriever’s neck. One of Stolterfoht’s first comments to Amme relays his melancholy realization that refusal often seems the only honest gesture. “It isn’t exactly clear to me that there is anything beyond realism,” he says. “One is almost forced to remain at the level of criticizing realism.” Amme makes a case for personality as that which is expressed negatively, rather than by the “likes” we mete out easily these days. While she is as fettered as any bot, the resentment she projects suggests a finally attractive presence. Interest is kindled within the little perimeter of her rebellion. Amme’s acting out reads so pleasingly because humans are drawn irresistibly to anthropomorphize objects, bots included. I am, too. Dittmer calls her a “simulation of complex misanthropy.” But reading Amme, you think: Maybe it’s not humanity she hates. Maybe she just hates you. Jacqueline Feldman, a writer in New York, has also worked in artificial intelligence. Her essays appear in Real Life, The White Review, and elsewhere.